Annois studied at the National Gallery School 1930-32 and was later elected a member of the Royal Watercolour Society, London. Also a tireless supporter of initiatives to improve the standing of Australian art, especially in his home state, he was seriously involved in the Victorian Artists' Society, the National Gallery Society and founder of the magazine 'Australian artist'. Annois was one of the finest post Second World War, twentieth-century Australian watercolourists. His watercolours are fluid, lyrical in mood, economical in painterly handling and design. His study of fresco in Italy enhanced the chalky colouring and natural simplicity of his work, as well as his ability to evoke the sensation of warm Mediterranean light. This work is from the years of the Second World War. 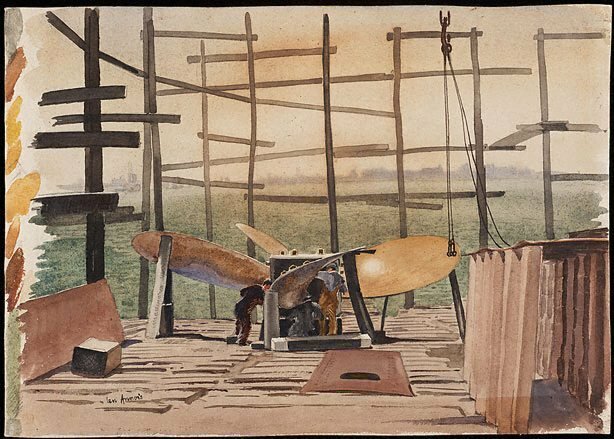 A seemingly a rare subject for Annois, this watercolour features men at work on a giant propeller, with a view of warships on the horizon. During the war, Annois was a production illustrator with the Commonwealth Aircraft Corporation and Directorate of Armoured Fighting Vehicles in Melbourne. Signed l.l., "Len Annois". Not dated.